Home Depot seems to have a fascination with adding more and more burners. In recent years, they pushed several 5-burner models, and now, a series of 6-burner models. Why? That is the real question. 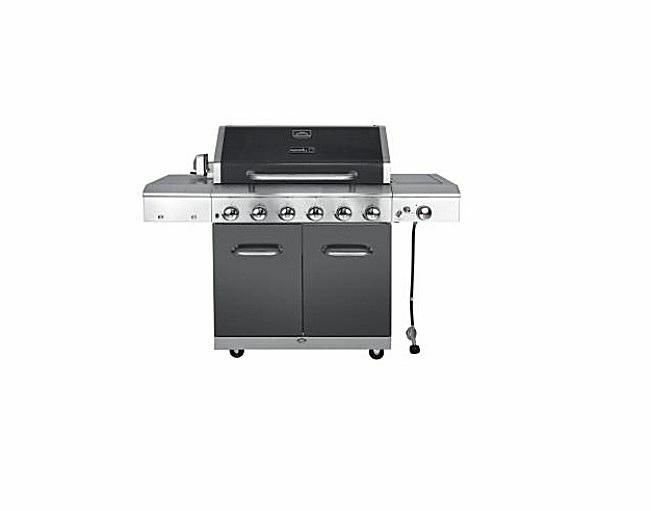 This monster of a gas grill has well over 550 square inches of cooking space that spans 34 inches side to side. This means that this grill could cook 30 burger patties at a time. Few of us need this much space. The bigger issue really is how that space is divided up. With six burners, it will take a minute just to fire the whole thing up; since each burner has only 10,000 BTUs, you are going to need several of them to produce the heat to cook for two. While the total heat output from this grill is in the "pretty good" range, broken up in this way suggests that they were more interested in adding knobs than power. The floor of any major hardware retailer needs to be covered with a wide range of grills every year. That range is both in price and in capabilities. Home Depot is a master of spreading the price points and offering lots of unique features. This gas grill from Nexgrill is the $300USD grill for the year (2016) and looks impressive will all those blue LED lit knobs on the front. The truth is that this grill would do just as well with four 15,000 BTU burners, but to even out the heat and make it more saleable, it has six 10,000 BTU burners plus the infrared "sear" side burner. The reasoning behind all this thinking is that at nearly half of the people who walk out of a Home Depot with a gas grill didn't go there intending to buy one. It is this kind of impulsive thinking that sells grills like this one. This particular gas grill's unique feature (which isn't all that unique) is the side mounted sear burner. Instead of the typical gas burner, this model has a 15,000 BTU infrared unit that is billed as the perfect way to sear a steak. Ironically, for a grill this size, it can effectively sear one steak at a time. These type of infrared burners use a ceramic tile diffuser to converts the flame of a gas burner to infrared. The technology has been around for decades, and the standout shortcoming of these types of burners is that the ceramic is fragile and can be cracked by extreme cold, movement, or the dripping of juices on the burner while it is hot. This feature adds little to the grill other than the promise of a restaurant quality steak that it really won't deliver. Ultimately, it is the weight that tells you about the quality of this grill. There are three, relatively heavy porcelain coated cast-iron cooking grates in here with six burners, knobs, valves, and a host of tubes and wires, not to mention the metal that has to make up the lid, cart, and body of this gas grill. And yet the whole thing weighs in at around 125 pounds. Think about how thin all that metal has to be to keep the weight down this much. Of course, for the manufacturer, thin metal reduces cost, but the light weight reduces the shipping expense as well.